Time to brush up on the Sweet Science. 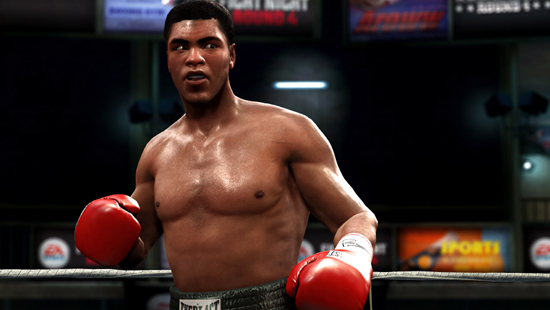 dding new boxers, a more robust create-a-boxer mode and better-looking graphics than before, Fight Night Round 4, the newest addition to Electronic Arts' franchise, brings players another fun-filled journey learning the Sweet Science. Control is very responsive.Fight Night continues EA's use of the analog sticks to control the majority of the action. Players have two main options for controls, here: either the new control stick layout or the old layout from Fight Night Round 3. Total Punch Control is very responsive, and if you're familiar with what EA has been trying to introduce to its sports games you shouldn't have too much of a challenge getting used to these controls. The game does has some difficulty recognizing some punches — mostly uppercuts being registered as body shots. And, too, the control schemes that are available are not enough; and as an added insult to old fans of the series, face-button controls are not currently available in the game. These fans are getting left out in the cold and there's no really good reason for it. Other EA sports games still have the older control schemes available for use, so it's very odd that they weren't included this time. To be fair, EA has announced that the old control options will be made available via free DLC in September but quite frankly that is far too late — the Fight Night fan base will have likely moved on to other games by this point in time. Beyond that, Fight Night Round 4 is an astounding game. Graphically, it is breathtaking; there is an unbelievable amount of detail to the boxers. You can see sweat drip off the boxer's bodies, details in the faces, bruises and cuts. It's very clear that a lot of effort went into making this one look even better than the last. The series still allows players to put their own face into the game, done via either a console camera or by uploading pictures to the EA Sports website. Results are very impressive and if you choose to use a camera attached to your console you'll have access to some very useful controls to make sure that your picture is taken accurately. Detail is unbelievable.Offered game modes contain what you'd expect: a straight-up quick fight, a legacy mode to take your chosen or created boxer and make them the greatest in the world, and online multiplayer. Single-player options are well done and have the kind of polish that fans have come to expect from the franchise. Online is strong as well; connections to my opponents were solid and lag was practically nonexistent. Ranked mode has a separate ladder for three weight classes, but I should note that champions for each weight class are going to take quite the dedicated effort to unseat. As far as gameplay is concerned, the only real change is that the between- round mini-games to fix up your boxer has been replaced with an automatic system using points earned during the previous round. While this does speed things up, players who've become accustomed to the system in Fight Night Round 3 may feel out of sorts. In all, Fight Night Round 4 is a fantastic-looking game and still is quite fun to play. Though fans of the series may dislike control options, they won't find too much of a learning curve between them and the ring.